Former environment minister Peter Kent, shuffled to the backbench on Monday, has a problem with the so-called "enemy lists" reportedly given to new ministers by the Prime Minister’s Office. A leaked memo shows that in the leadup to this week’s cabinet shuffle, the PMO asked ministerial offices to provide a list of unhelpful bureaucrats and "friend or enemy stakeholders" to guide the incoming boss on who to meet and avoid. The PMO has not confirmed or denied the memo's authenticity. Kent told Postmedia’s Lee Berthiaume that while it makes sense for an incoming minister to be briefed, language the separates friends from foes is "juvenile" and harkens back to the "enemies list" compiled by former U.S. president Richard Nixon, which came to light during the Watergate scandal. It's unclear whether Kent was referring to the use of the term by the press or by the PMO. "That was the nomenclature used by Nixon," Kent told Postmedia. "His political horizon was divided very starkly into friends and enemies. The use of the word 'enemies list,' for those of us of a certain generation, it evokes nothing less than thoughts of Nixon and Watergate." Nixon famously kept a list of politicians, reporters, educators and even entertainers, such as Paul Newman, who criticized him in the 1970s. He reportedly had these opponents trailed by private detectives and targeted for tax audits. While Kent may not have directly compared Stephen Harper to Richard Nixon in this instance, at least one journalist has drawn the link. 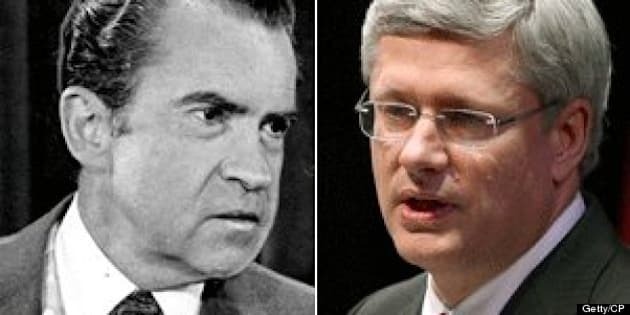 The Toronto Star’s Thomas Walkom accused the prime minister of slipping into "Nixon mode" in a scathing column in May that touched on the robocalls scandal and Wright-Duffy affair. "Like Nixon, Harper has a bitter side. He is unforgiving. His visceral dislike of his political enemies — particularly the Liberals — can be over the top," Walkom wrote. But Walkom was particularly fired up about revelations that the Conservative government spied on aboriginal advocate Cindy Blackstock, whom he wrote "ended up on the enemies list for criticizing Ottawa’s approach to natives." Blackstock is executive director of the First Nations Child and Family Caring Society, a group fighting the federal government in court over First Nations child welfare programs. Federal Privacy Commissioner Jennifer Stoddart found two government departments, Aboriginal Affairs and the Department of Justice, went too far and violated the spirit of the Privacy Act by compiling reams of information from Blackstock’s personal Facebook page. "It is not obviously clear what relevance the personal information available on the complainant's personal Facebook page could have had to [Aboriginal Affairs'] policy development, or the government's defence of the Caring Society's human rights claim," her report stated. The issue is similar to a story from t he 2011 federal election when London, Ont., teen Awish Aslam was allegedly turned away from a Harper rally because of a photo on her Facebook page with then-Liberal Leader Michael Ignatieff. There have also been many questions about how much Harper’s office is now prepared to meddle in partisan politics. A Barrie, Ont. newspaper revealed in May the PMO was behind leaks of unflattering information about Liberal Leader Justin Trudeau. In late June, HuffPost Canada revealed that a Parliament Hill protest against Trudeau was organized by the PMO and partially staffed by young Tory interns.